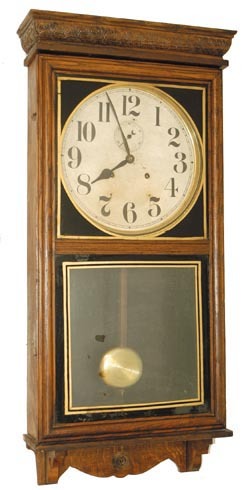 Waterbury Clock Company hanging store regulator, "Stork", C. 1915. This is a 30 day time only clock, running very strong, has double springs, and a seconds hand. The old oak case is 36" high, now with a replaced top and bottom stained to match the case body. The number "154" is stamped inside the case which I believe dates the clock "April 1915". The bob, stick, and beat scale, are all original. The two glasses appear to be original to the clock. There are remnants of an old label inside, and a nice big label on the back, protected with plastic. Ly-Waterbury #727.